But first, downcoming. On Thursday, I had a flight before dawn, during the hours when the Geminid meteor shower was in full force. From the ground, an observer who gets away from the lights of urban areas can hope to see about a meteor a minute. Sean and I were flying north from Kenora to Kingfisher Lake, so we were a long way from city lights. Better still, we were at Flight Level 210, about 21,000 feet above sea level, which put us above most of the atmosphere. You may be thinking, “Tim means above most of the haze and pollution,” but air density up there is less than half of what it is at sea level, so we really were above more than half of the atmosphere by weight. We had very clear viewing conditions, and we saw a shooting star as soon as we leveled off and darkened our cockpit. Given our restricted field of view – pressurized airplanes don’t have picture windows – we hoped to see about twenty meteors during our forty minutes of level flight. We counted 59. That’s one every forty seconds. It was an immensely satisfying flight. And now back to earth. The title of this post refers to some public appearances I’ll be making in December and January. On Tuesday, December 19th, I’ll be popping in to the Q-104 radio studio to chat with Ken O’Neill. The interview will take place at around 9:00am, and will likely go to air soon after. Update: the interview is recorded, and should go to air around 8:10 Wednesday morning. One thing I’ll be mentioning is that Avians is now being carried by Novel Ideas in Dryden. Please support your local independent bookstore. They support authors like me. On Friday, December 22nd, I’ll be at Elizabeth Campbell Books on Main Street in Kenora (next door to the Plaza restaurant, if you weren’t sure.) I’ll be chatting about Avians and signing copies of for an hour or two starting at 7:00pm. You don’t have to wait until this late date to buy someone my book for Christmas, of course; I’m delighted to sign and personalize copies regardless of when they were purchased. Since the August release, Elizabeth Campbell Books has ordered several cases of my books. My publisher must have been impressed, she featured Elizabeth’s store on the Five Rivers Publishing blog back in October. On January 25th, I’ll be in Winnipeg to speak at the Royal Aviation Museum of Western Canada at 7:00pm. The meeting of the Manitoba Chapter of the Canadian Aviation Historical Society is open to the public and free to attend, and there will be coffee and doughnuts on hand. I’ll present a version of my Alternative Aviation slideshow and talk: I run through an entire glossary of unusual kinds of flying machine, from Autogyros to Zeppelins. If you didn’t know there’s been a flight by a human-powered helicopter, or that nuclear powered airplanes were once a thing, you might find something entertaining in my presentation. I plan to introduce The Lake of the Woods Ice Patrol for some of those Winnipeggers who may not know about it, and yes, I’ll have copies of Avians on hand. I’m looking forward to a fun winter. I should have updated sooner, but I’ve had a rash of computer problems. I have recovered my data and my computer is running normally. For now. Fingers crossed. Here’s a look at some things in the next few weeks. Back when Avians first became available for pre-order from the big booksellers, some of my friends informed me that Amazon was listing the book as available at the end of June, instead of the first of August. I wasn’t sure if that was right, but those people have received their Kindle copies, so there you go. If you can’t wait, Amazon has it available now. Some reviews are up at Amazon, Library Thing, and Goodreads already. So far, things are looking encouraging, with four and five star reviews. On the 18th of July, there will be a review of Avians on Bonnie Ferrante – Books for Children. Bonnie covers books for children for all ages, from ABC’s to Young Adult. I also did a fun interview with her and that post will follow a day later. She always finishes her interviews with three random questions, and I think they reveal more about an author than the more logical questions do. 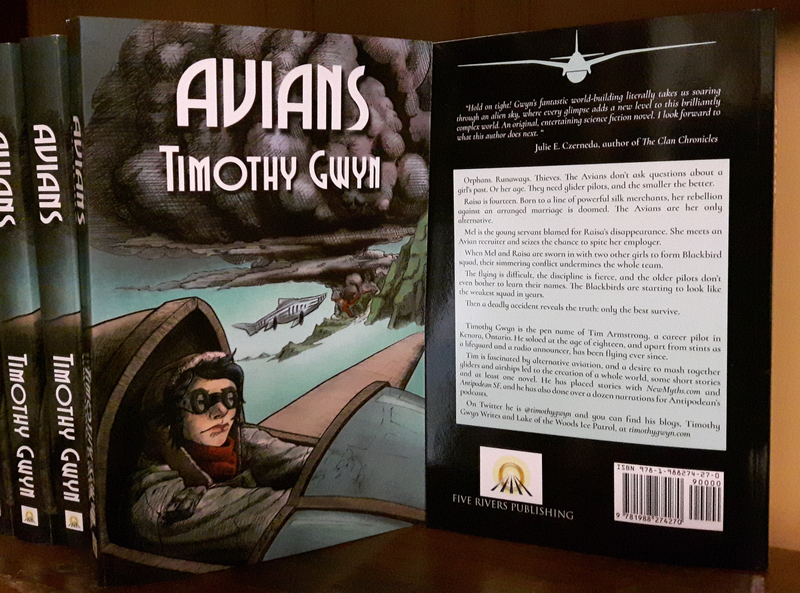 August 1st: the official release of Avians. It will be available from Barnes & Noble, Chapters/Indigo, Rakuten Kobo and Five Rivers, as well as Amazon. When Words Collide is in Calgary on August 11, 12 & 13. Friday evening I’m on a panel on Worldbuilding. My particular focus is on how to show what isn’t there. On Saturday morning I’m on a panel on Pantsing versus Plotting, which should be fun, as I do neither. I’m a quilter: I write the exciting parts first, then stitch them together, outlining retroactively. Saturday afternoon I’ll be at Five Rivers Presents, for the Avians launch. Yay, finally! Then I have to dash across the road to do my presentation on Writing Aviation in the other building. Saturday evening I will put in an appearance at the mass Autograph Session. I’ll probably have plenty of time to chat with the other authors, as there won’t be very many copies of my book in the wild yet. Sunday will be a fun day, I’m the reader for the Science Fiction session of Live Action Slush. It will be my goal to confound the evil editors by making every story sound wonderful. Apart from all that, I had an offer to share a table with some friends in the dealer room. I’ll post further details on rooms, times and co-panelists when the schedule is finalized. After I return from When Words Collide, on Tuesday, the 15th of August, I’m tentatively scheduled to do an event at the Kenora Public Library at 2:00 pm. I’ll read some short sections of the book and give one or two copies to the library, and then offer to sign some books. If you buy a copy at the event, Elizabeth Campbell Books will donate a portion of the proceeds to the library fund.